Habit: Annual, perennial herb, < 70 (200) cm; sap milky. Stem: generally +- branched, generally erect, generally glabrous. Leaf: generally basal and cauline, alternate, sessile, sometimes reduced distally on stem, entire, toothed, or +- deeply pinnately lobed or divided. Inflorescence: heads liguliflorous; involucre generally bell-shaped; phyllaries in 3--6 series, mid-stripe green or +- red; receptacle flat to convex, shallowly pitted, glabrous or with fragile, smooth bristles < 5 mm, epaleate. Flower: corolla yellow or white, readily withering; ligules of outermost flowers exserted 1--15 mm, generally +- red- or purple-striped abaxially. Fruit: 0.9--4 mm, +- fusiform, tip truncate, generally smooth; ribs 15 (5 generally prominent, 10 +- obscure), generally extending to tip; outer pappus 0 or of teeth < 0.5 mm, or rounded-toothed crown, and 0--6 smooth, persistent bristles, inner pappus of 12--32 bristles fused at base, readily deciduous, minutely barbed proximally. Species In Genus: 20 species: western North America, southern South America. Etymology: (Greek: soft hair) Note: Anisocoma, Atrichoseris, and Calycoseris perhaps best placed here (Lee et al. 2003 Syst Bot 28:616--626). Habit: Annual <= 75 cm. Stem: simple or +- branched, ascending or erect, glabrous, +- glaucous. Leaf: basal +- fleshy, lance-linear to ovate, wavy-lobed, base slightly narrowed; proximal generally (ob)lanceolate, toothed, short lobed, or parted to midrib, distal reduced, generally ear-like at base. Inflorescence: heads generally few in cyme-like clusters; involucre 10--22 mm, generally spheric; outer phyllaries widely overlapping, +- equal, widely ovate to round, glabrous, midstripe generally +- red, margin widely scarious; receptacle densely bristly. Flower: corolla 8--20 mm, generally pale yellow (white), ligules of outermost flowers exserted 2--12 mm. Fruit: 1.6--3.2 mm, prominent ribs, +- winged, extending beyond tip; outer pappus teeth uneven, bristles 2--6. Chromosomes: 2n=14. Unabridged Synonyms: Malacothrix coulteri Harv. & A. Gray var. cognata Jeps. Citation for this treatment: W.S. 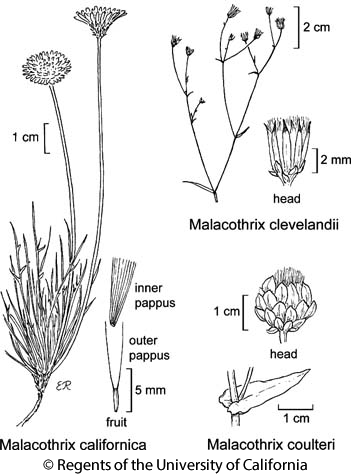 Davis 2012, Malacothrix coulteri, in Jepson Flora Project (eds.) Jepson eFlora, http://ucjeps.berkeley.edu/eflora/eflora_display.php?tid=4061, accessed on April 24, 2019. SnJV, CW, n ChI (extirpated), WTR, PR, SNE, DMoj, n DSon; Markers link to CCH specimen records. Yellow markers indicate records that may provide evidence for eFlora range revision or may have georeferencing or identification issues. Purple markers indicate specimens collected from a garden, greenhouse, or other non-wild location.